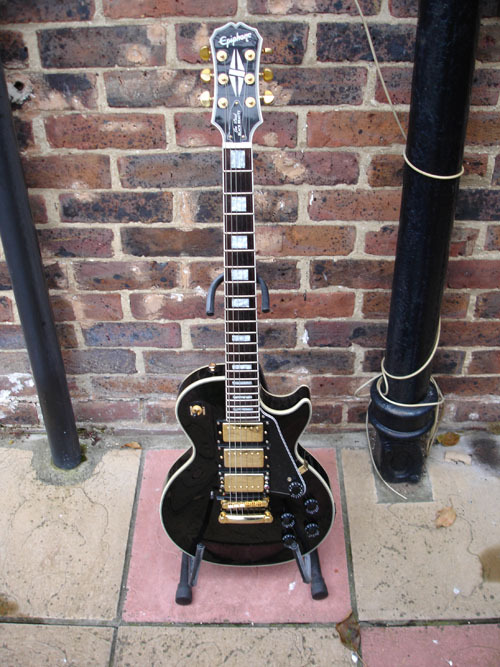 I hadn’t played a Gibson Les Paul style guitar since I sold my Columbus copy back in 1996, so when I saw one of these come up on eBay for £330 I thought it was a bargain. So I purchased the guitar and an internal MIDI pickup kit from Roland to do a DIY install so I could use it with my Roland GR-33 and VG-99 pedal boards. The guitar was really well made for a copy and I was very surprised by the finish and most importantly the variety of tones you could coax from the instrument with the three humbucker pickups without any fancy effects. The instrument had a good weight and the setup was low, with minimal fretbuzz. Converting the instrument into a GK-2A midi guitar was trickier than installing it into a standard Fender shape body because you don’t have the routing beneath the scratchplate to play with. Instead, you have to fit the circuit board in the existing cavity where the tone-pots are housed, which is a bit of a squeeze and fitting the control buttons were also a problem, unless I wanted to drill holes in the front of the guitar and ruin the finish. I didn’t want to do this, so I came up with a novel way of housing the control buttons, pickup switch and activity LED light. Using a very small hand-drill, I made holes in the plastic pickup housing closest the bridge and housed these controls there. I needed a steady hand with the soldering because there wasn’t much space to move and I purchased some small switches from Maplin for the job. It was a first class job and I really impressed myself. The only other fly in the ointment was fitting the separate volume pot for the MIDI output, and I could either drill a hole in the body or fit it into the scratchplate. I did the latter, even though it was a tight squeeze. 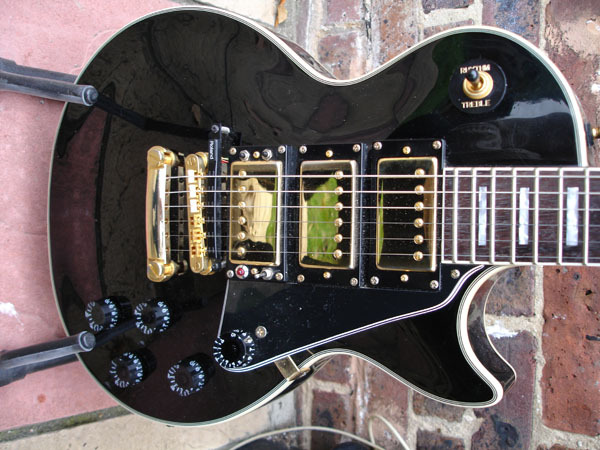 The Epiphone was a great MIDI guitar like this and I really regret selling it on, because my GK-2A installation was a thing of beauty, even if I do say so myself. 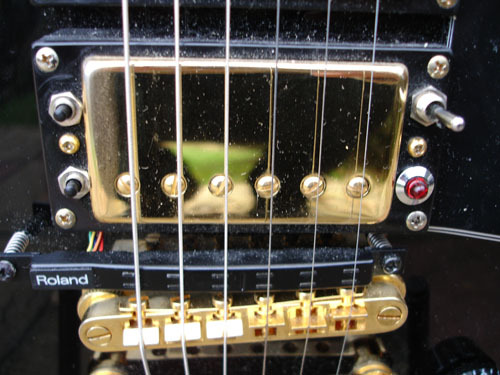 The main reason for me selling it was that the brass fittings gradually lost their lustre over time and I read elsewhere cases that they actually started to go green, so I decided to sell while the guitar was still in good cosmetic condition. Wow! Excellent job in the install. The guitar is a great piece of work. I also use the gr-33 as an intrgral part of my rig. I sacrificed a double cutaway Les Paul Standard and had the gk p/u installed at a reputable shop. I wish I had seen your install. before mine was done. They did a fine job but the face of the LP was drilled into for the install. I had been using a Roland-ready Strat for a couple years, but I wanted that fat Les Paul sound in my arsenal also. I wish there was an award category such as “Best GK-2A Installation” available, because you’d win, and as humble as you seem about it, that is some fine creative engineering! That’s the best GK-2A installation I’ve seen, anyway. Wonderful choice of GK volume control position on the tip of the wing of the pickguard!